A ‘Sage and Thrift’ Supper. I’ve always envied the Americans for Thanksgiving. Not for the origins or history surrounding it (which I remain largely ignorant of, but suspect, like most history, it is a mixed bag of truths) but the fact that it’s a great excuse to get together with people you love, to eat, drink and share a bit of gratitude for the good things in your life. So, in the spirit of Thanksgiving and having been inspired by the wonderful Kinfolk magazine, this weekend my dear friend Jo and I held the first of what we hope to be a regular small gathering of people, sharing food, music and thoughts in the comfortable and relaxed surrounding of home. Snuggled on sofas and with the laid-back eclectic sounds of Fip (French online radio) in the background, we happily worked our way through a communally produced supper of the best French Onion soup I think I’ve ever eaten, Triple Chocolate Cheesecake, which was healthy, yet utterly decadent (from the amazing Veggie Runners. You need to visit their website, they’ll be adding the recipe soon! ), various cakes and several pots of tea. And it worked really, really well. With no standing on ceremony allowed, I am hoping that these gatherings will help deepen friendships and create new ones, develop ideas and plans, share projects and enable us to spend a bit of ‘slow’ time in good company. Saturday’s subjects included natural skin-care, producing smartphone Apps, knitting patterns, running and plans for a 2013 surfing trip, which for someone with an almost endless list of interests, was a great way of spending time! 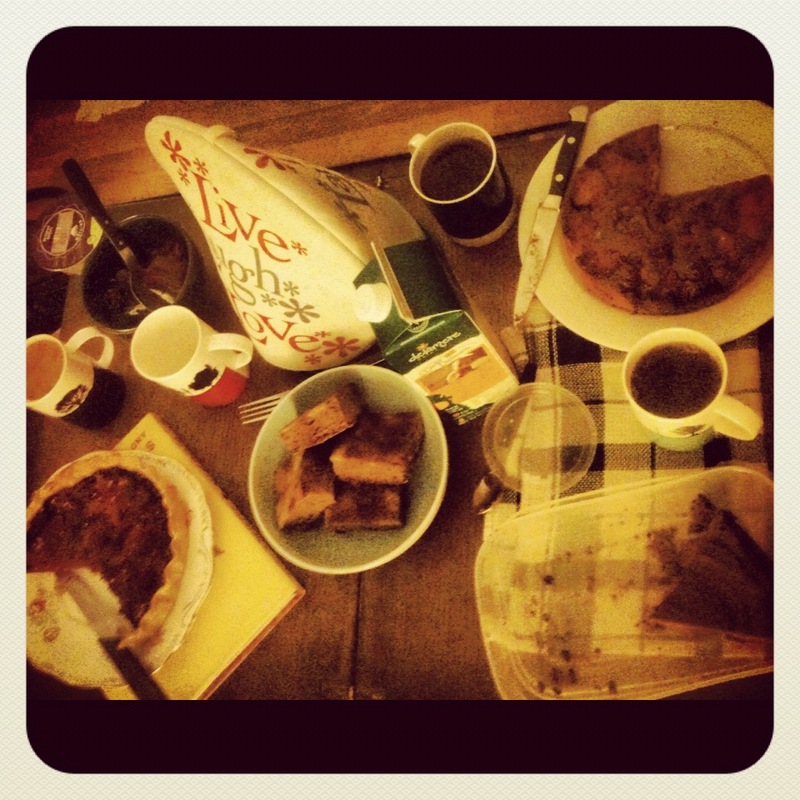 The supper also gave us the chance to trial our first Cookbook Club. Many people, like me, have an irresistible urge to buy beautiful cookbooks and as a result, and despite best efforts, have an enormous collection gathering dust. Our solution; a monthly swap. Anyone wanting to join in brings a cookbook that for some reason they’ve not been using and swap. At the end of the month they have the option to continue with another swap or withdraw themselves and their book until next time. It’s a great way to try out lovely new recipes without spending any money or having to find more space on your bookshelf. Each cookbook will be given a logbook as a swap diary for people to write about what they chose to cook and their experiences, which will be returned to the cook book owner, alongside the books themselves. 7 Responses to A ‘Sage and Thrift’ Supper. Love the cookbook swap idea, I’ve got some favourites and equally some I’ve just never got on with, swapping them would be fab! Oh my, it sounds like such a lovely evening – and idea!